Which would you rather eat: Nutritious Green Zucchini, Lighter Choice Zucchini or Slow Roasted Caramelized Zucchini Bites? Researchers from Stanford University Department of Psychology set out to see whether deliciously descriptive vegetable labels would entice college students to eat more of the good stuff. Here’s what they found, and how you can put the findings into practice. Though the dishes with the same ingredient (take the zucchini example above) were prepared the same way, they were labelled in one of four ways. Beets, for instance, could be called ‘Dynamite Chili and Tangy Lime-Seasoned Beets,’ ‘Beets,’ ‘Lighter Choice Beets with No Added Sugar’ or ‘High-Antioxidant Beets.’ The intent was to compare the more inspired labeling to normal or healthy-sounding labeling (with one healthy version being restrictive and the other positive). Only about 10 percent of American adults meet the veggie recommendations of 2 to 3 ½ cups per day. It turns out, we eat with our eyes, though that wasn’t dependent on the looks of the dish — recall that the four different-sounding dishes were prepared the same — but based on how the side was labeled. Among the nearly 28,000 total students who ate in the dining hall during the study period, the great-tasting label resulted in diners choosing 25 percent more veggies compared to the basic-labeled version. Even more impactful, the inviting-sounding veggies were scooped up 35 percent more often than the healthy, positive-sounding ones, and 41 percent more often than the healthy, restrictive ones. In addition to choosing vegetables more often, students also piled more produce on their plates. It’s not so surprising that luscious-sounding produce inspires healthier eating. Even the veggie-lover in me would go for the rich buttery roasted sweet corn over the reduced-sodium corn or vitamin-rich corn (other study comparisons). Am I right? The phenomenon extends beyond the veggie aisle, too. Several years ago, Campbell’s Soups had to add back the sodium they had taken out because in slashing the salt (and making the cuts known to consumers), it resulted in poor sales. And a May, 2017 survey conducted by the International Food Information Council Foundation (IFIC) found that taste remains a key purchase driver for 84 percent of those polled. By comparison, among those surveyed, 63 percent will buy food based on healthfulness. Though this study assessed the taste-first model in a campus dining hall, why not try this approach in your own dining room? In my kitchen, I serve roasted broccoli coins over sliced broccoli stalks, crispy green beans instead of sautéed green beans, and garlicky spinach with parmesan rather than a side of spinach. I now have a 13-year old who eats all of the above (and then some). This is key as it’s reported that only about 10 percent of American adults meet the veggie recommendations of 2 to 3 ½ cups per day. The same report suggests that only about 1 percent of teens and tweens are meeting their needs. To help inspire you and your family to get more goodness on your table, I selected the following recipes that sound incredibly appetizing. My hope is that these must-try veggie dishes will get you to double up on your intake! Fry lovers, this simple spin on the fast food classic can get you one step closer to your daily veggie quota. Though we’re focused on taste here, I have to give a little love to the carrots, which up the nutrition factor significantly. I’m also loving on the addition of Greek yogurt in the Aioli. It’s a protein-packed touch. I’m so inspired by this flavored version of my long-time favorite kale chips. If you’re not familiar with nutritional yeast, you can usually find it with the specialty flours in natural foods stores, including Whole Foods and Trader Joes (which has a private label version). Though this recipe sounds incredible, I’ve made a much simpler version roasting the kale and then sprinkling with sea salt and nutritional yeast. The one drawback: It takes longer to cook than it does for my son and I to inhale the chips! What could be simpler—or tastier—than fresh corn, melted butter, a squeeze of lime and some seasonings? As is noted here, if you don’t have queso fresco on hand, you can always substitute feta. There is no doubt in my mind that this summer-fresh salad will help you reach your daily veggie goal. If you have a house full of chip fans, this beet version might get them to load up on their veggies. Though the recipe calls for rice vinegar, I’ve often used cider vinegar in its place. 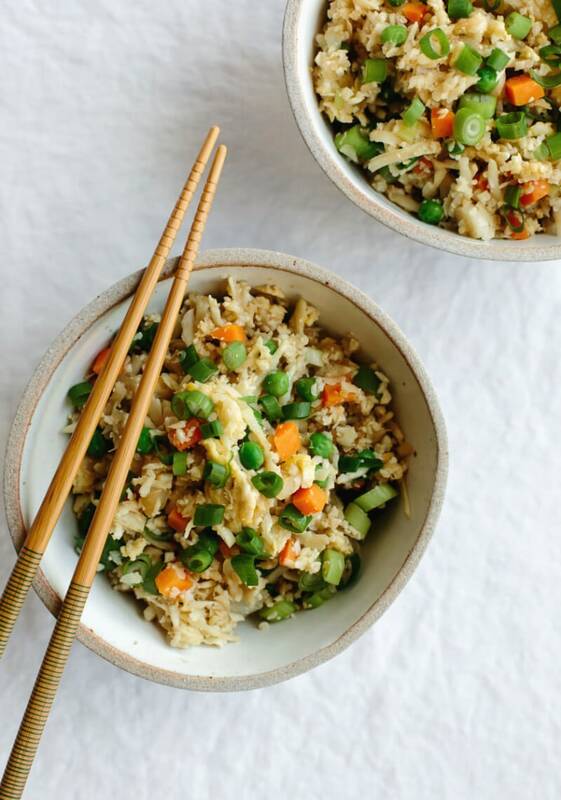 If cauliflower fried rice doesn’t encourage you to put a heaping pile of vegetables on your plate, I don’t know what will! Using a food processor to pulse cauliflower florets produces rice-like granules that make an incredible substitute for the grain. Though this recipe starts with a full head of cauliflower, if you’re pressed for time, your local Whole Foods probably stocks a pre-prepped version. I’ve also noticed frozen cauliflower rice at Trader Joes, and in mainstream markets, you can find one from Birds Eye. I don’t know about you but I’m one of those people who thinks everything tastes better with a little cheese! If you’re like me, then you may find yourself eating more green beans when they’re tossed with some bleu cheese. This recipe pairs green beans with the stinky cheese and walnuts, but I also enjoy tossing them with parmesan and almond slivers.